The Secretary of State for Defence, Philip Hammond, has visited UK troops in Helmand as part of a two-day trip to Afghanistan. During his visit, the Defence Secretary witnessed first-hand the security transition to the Afghan National Security Forces (ANSF). 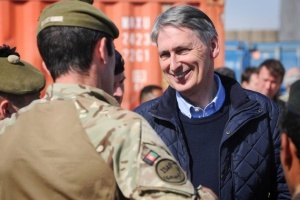 During the Helmand leg of his visit, Mr Hammond met with senior military commanders from both the International Security Assistance Force (ISAF) and the ANSF at Camp Shorabak, the headquarters of 215 Corps of the Afghan National Army (ANA). Accompanied by Lieutenant General Nick Carter, Deputy Commander ISAF, Mr Hammond also met Brigadier General Sherin Shah, commander of 3rd Brigade, 215 Corps based in central Helmand. At Observation Post Sterga, Mr Hammond was briefed by Lieutenant Colonel Matt Jackson, Commanding Officer Technical Support Unit, in Nahr-e Saraj. He then flew to Patrol Base Wahid where he met with members of 1st Battalion The Royal Ghurka Rifles. Yesterday, the Defence Secretary held a number of meetings in Kabul including with the new Afghan Defence Minister Bismellah Mohammadi. Transition is proceeding very well � it is on track, the Afghans are taking more and more responsibility for planning and executing operations and British Forces are more and more in an advising and assisting role. The Afghans are developing these capabilities faster than we expected and we have every reason to believe that they will be able to maintain security as the ISAF forces draw down.